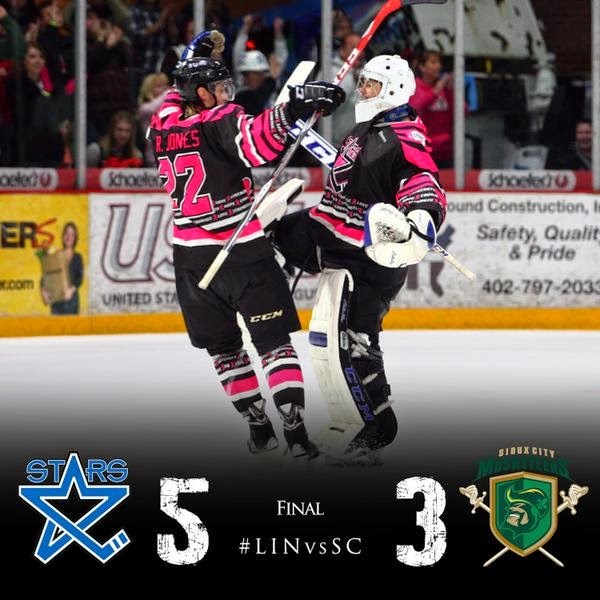 It was an up and down weekend for the Lincoln Stars as they skated to a quality 5-3 win Friday night at the IceBox against the Sioux City Musketeers (top team in the west), but then gave up a 3-1 lead in Omaha against the Lancers and lost 5-3. The Stars currently have a record of 6-10-3 (15 points) and are in seventh place in the USHL western conference, five points behind the sixth place Omaha Lancers, and one point ahead of the eighth place Waterloo Blackhawks. Click here to view the current league standings. Against the team that blanked them on Thanksgiving night, the Stars got out to a quick lead and held on to beat the visiting Sioux City Musketeers by the score of 5-3. Seven of the eight goals scored in this game all game in the first period, and it was Lincoln's Ludvig Hoff who got it started with 5th of the season just one minute and one second into the period. It was "Teddy Bear Toss" night at the IceBox for this game, so the fans got to throw their stuffed animals barely after first sitting down. I'll post a video at the end of this article that I took with my phone of the scene at the IceBox as the bears started to fly. Ludvig's goal, and the next goal scored by Lincoln which came from Chris Klack about 11 minutes later, were almost mirror images of one another. Both players has possession of the puck just to the left of the Sioux City net before skating a few strides in front of goaltender Collin Olson before stuffing it between the goaltender's pads. After the Klack goal which gave Lincoln a 2-0 lead with roughly 9 minutes remaining in the first period, the Sioux City coaches pulled goaltender Collin Olson and replaced him with Cam Gornet who played the rest of the game. Starting with the Klack goal, both teams combined for six goals scored in the next eight minutes of the first period. Miguel Fidler gave Lincoln a 3-0 lead at the 12:19 mark of the period thanks to a powerplay goal scored. On the play, a Lincoln shot from inside the blueline was stopped by Gornet, but the rebound went right to Fidler who jammed it into the open net. The Muskies stopped the bleeding temporarily with a goal scored exactly three minutes after Fidler's PP goal to pull to within two at 3-1. However, Patrick Polino gave the Stars a 4-1 lead at the 15:49 mark thanks to a nice play by teammate Joe Lappin. Lappin skated the puck into the SC zone along the boards and did a great job getting past a Muskies defender while keeping possession of the puck. Lappin then fired a pass to a streaking Polino who had beaten his man before redirecting the Lappin pass past Gornet. Polino's goal, which which was his fifth of the season, turned out to be the eventual game-winner. Sioux City fought back with two goals scored within a minute very late in the first period to pull to within one goal. After a wild and crazy first period, the Stars took a 4-3 lead into the first intermission. Shots were 16-15 in favor of Lincoln. Lots of scoring in the opening twenty minutes, and not a lot of defense by either team. Stars goaltender Cam Hackett stopped 12 of 15 shots on goal in the first period, but then stood on his head the rest of the game stopping all 28 Sioux City shots he faced. Seven goals were scored in the first twenty minutes of the game, but only one was scored in the remaining forty minutes and that goal came from Stars forward Dominick Sacco in the second period. Sacco's goal was a beautiful shorthanded tally, which was the first SH goal the Muskies had given up all season long. On the play, Sacco and Ludvig Hoff led the charge out of their own zone and entered the SC zone 2-on-2. Hoff passed it Sacco just as the two entered the SC zone, and it was Sacco who pulled off a nifty drag move using his defender as a screen before ripping the shot past a surprised Gornet. It was Dom's second shorthanded goal of the season. The score would remain 5-3 the remainder of the second period, and all of the third. Stars were outshot 28 to 10 in the final two periods of the game, but Cam Hackett stood tall with a number of big saves. Hackett, who stopped 40 of 43 on the night, was the main reason why Lincoln got the two points in this game. Lincoln seemed to go into a shell after getting the 5-3 lead, especially in the third period. But overall, it was a quality effort against the top team in the western conference. It was looking good for the Stars on Saturday night in Omaha as they built a 3-1 lead over the Lancers, but Lincoln gave up four unanswered goals and lost to their arch-rival by the score of 5-3. I didn't attend this game, nor did I watch it on FASTHockey, so this recap will be very brief. If I have time today I'm hoping to watch a replay of it on FASTHockey. If that happens, I'll come back and add some thoughts. I had a few friends (both Lincoln and Omaha fans) attend the game and both said pretty much the same thing. Stars played very well to start, got out to the 3-1 lead, but then put it into auto-pilot. The Lancers took awhile to wake up, but once they did, they pushed the Stars around again physically and gained control of the game. Lincoln goals were scored by Blake Christensen, Biagio Lerario, and Joe Lappin. For the second time in 19 games this season, the Stars outshot their opponent, this time 31-30 over the Lancers. Lincoln goaltender Peyton Jones stopped 25 of 30 shots in the loss. Considering how well Cam Hackett had played the past three games, I'm surprised he didn't get the start. But maybe the Lincoln coaches wanted to give him a rest. The Lancers started goaltender Zach Driscoll in this game, which was his very first USHL appearance after being aquired by the Austin Bruins of the NAHL. Not a bad start for the '97 netminder as he stopped 28 of 31 for the win. I mentioned this briefly on Twitter this morning, but as a fan it's pretty frustrating to see the Stars lose so many games to the Lancers the past few seasons. Since the start of the 2011-12 season, Lincoln is 8-17-3 against Omaha. So basically, the Stars have only won 8 games in the past 28 meetings between the two teams. There's no better feeling beating the Lancers, and there's no worse feeling losing to the Lancers. If we want to look at some positives from this weekend, it seems as if the offense has woken up. Also, Lincoln got out to early leads in both of these games, which is good. For the most part, the Stars stayed out of the penalty box as Sioux City had only 3 powerplay opportunities, while Omaha had only one last night. It will be a busy week for the Stars coming up with three games in five days. On Tuesday night in Kearney, NE, the Stars will take on the Tri-City Storm. Friday evening at the IceBox, Lincoln will host the Dubuque Fighting Saints. Then on Saturday in Waterloo, the Stars will knock heads with the Blackhawks in what could be a battle for last place in the western conference standings. Another season, another losing record to the Lancers. Sigh. There are still six games left this season between Lincoln and Omaha. Still some games left for Lincoln to win the season series. But they'll have to play a lot better. I love my Stars but I think they are too small and too young. I think the youth issue has contributed to the consistency problems we have seen. That's just my opinion as a fan watching from the stands. Go STARS! Still lots of time to figure it out, but we need a big push this second half to squeak in the playoffs...hopefully we can do it.